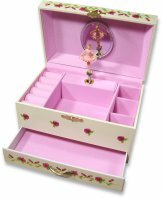 This large musical jewellery box is ideal for girls. 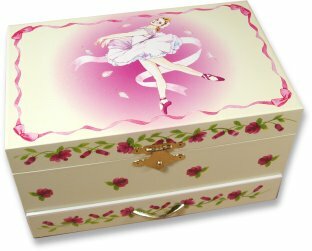 With a ballerina design and pink velvet interior it is a perfect present for a young lady. The tiny ballerina pops up and revolves to the music when the lid of this music box is lifted. The front has a pull out drawer for further storage. The main body of this musical box is made from a thin wood board (the drawer is moulded) and covered in a glossy printed paper with colourful designs. The velvet lined interior of this music box is fitted with a clockwork musical movement wound by a key at the back of the box leaving room at the front for jewellery storage. This musical box plays the tune 'Swan Lake'. Approx Size : 180 x 114 x 99mm. IMPORTANT NOTICE - Please be aware that although these are childrens music boxes suitable for 3 years and over, they do contain small parts and a removable metal key.